I am very grateful for the opportunity to discuss my book on EJIL: Talk! and Opinio Juris, as am I grateful to the commentators on both blogs for taking the time to read and discuss it. In this introductory post I’ll try to outline the book’s main arguments and themes and my approach generally in analysing a very complex topic. The book is divided into five chapters. The first, introductory chapter sets out the scope and purpose of the whole study. It defines the notion of the extraterritorial application of human rights treaties, explains that the law of treaties sets no general rules on extraterritorial application, and outlines the basic normative framework of the human rights treaties which are the object of the study, looking in particular at the various types of state jurisdiction clauses that one finds in these treaties, and their relationship with other relevant provisions, such as the colonial clauses. Whether a human rights treaty protects a particular individual in an extraterritorial context is legally a matter of treaty interpretation, and this chapter sets the stage for this interpretative exercise. My main focus is on treaties protecting civil and political rights, for the sole reason that there is much more case law and other material to work with in respect of these treaties than with those protecting socio-economic rights. That said, the book proceeds from the assumption that there is something to be gained from focusing on problems common to all or most human rights treaties, and views these treaties as a whole. Hence, it is generally structured thematically, issue by issue, not chronologically or treaty by treaty. Of all the treaties, I give most attention to the European Convention on Human Rights, for two reasons. First, the ECHR system is by far the strongest of all human rights regimes (if far from perfect) in its ability to effectively secure compliance and have a direct impact on state policy. The stakes are highest in Strasbourg, because it will be listened to. Second, it is precisely because the stakes are highest in Strasbourg that the jurisprudence of the European Court of Human Rights on extraterritorial application is the richest and the most developed. At the same time, it is the most problematic, suffering from rampant casuistry and conceptual chaos. It is a jurisprudence of (at times quite unprincipled) compromise, caused mostly be the Court’s understandable desire to avoid the merits of legally and politically extremely difficult cases by relying on the preliminary issue of extraterritorial application. At the same time, the jurisprudence of the European Court has the most to teach us on questions of both law and policy that are relevant for all human rights treaties. Opinio Juris and EJIL: Talk! are happy to announce that over the next few days we will be both be hosting a discussion of Marko Milanovic’s recently published book: Extraterritorial Application of Human Rights Treaties: Law, Principles and Policy (Oxford Univ Press). Marko’s book examines the question when a State owes human rights obligations under a treaty to persons located outside its territory. This is a question on which there has been conflicting case law and much confusion. This [book] attempts to clear up some of this confusion, and expose its real roots. It examines the notion of state jurisdiction in human rights treaties, and places it within the framework of international law. It is not limited to an inquiry into the semantic, ordinary meaning of the jurisdiction clauses in human rights treaties, nor even to their construction into workable legal concepts and rules. Rather, the interpretation of these treaties cannot be complete without examining their object and purpose, and the various policy considerations which influence states in their behaviour, and courts in their decision-making. The book thus exposes the tension between universality and effectiveness, which is itself the cause of methodological and conceptual inconsistency in the case law. Finally, the work elaborates on the several possible models of the treaties’ extraterritorial application. It offers not only a critical analysis of the existing case law, but explains the various options that are before courts and states in addressing these issues, as well as their policy implications. A very distinguished group of scholars, from both sides of the Atlantic, will offer their views on Marko’s book and on this vexed question of extraterritorial application of human rights obligations. On EJIL: Talk! Yuval Shany (Hebrew University, Jerusalem), Vaughan Lowe (Oxford) and Irini Papanicolopulu (Milan-Bicoca and Oxford) will offer their views. On Opinio Juris, it will be Sarah Cleveland (Columbia), Kal Raustiala (UCLA) and OJ’s own Peggy McGuinness (St John’s). We are grateful to them for agreeing to participate in what I am sure will be a fascinating discussion. The discussion will start with an introduction by Marko (on both blogs) of his book. Our commentators will weigh in with comments through the rest of this week. Marko will respond to their comments early next week. Readers are invited to join in the discussion. Second, there is a pervasive sentiment that the next Prosecutor should come from Africa. While this view has been put forward in very different ways and some of you have expressed explicit support for candidates from other parts of the world, we feel nevertheless safe to conclude that a consensus will only be possible if indeed we focus on the two names from the African region. Since last Friday, the consultations held have therefore focused on the two potential African candidates. Our consultations since have indicated that this is indeed the right direction and that there is general acceptance of this approach. As readers know, all the situations currently being investigated by the ICC and where prosecutions have arisen are from Africa. Also as we have covered on this blog several times there has been intense criticisim by the African Union (and some Afrian States) of the ICC with there being an accusation of bias against Africa. It is all of this that has led to the feeling that next Prosecutor should come from Africa. It is also worth noting that African Union criticism of the ICC has included personal criticism of the current prosecutor Luis Moreno Ocampo. The election of an African prosecutor should help to deflect some of this criticism and should help to reduce the tensions between Africa and the ICC. I do think that countering the perception that the ICC is not an anti-African court is very important. It is also important for African and indeed the world to see that the court is not an instrument by others against Africa but that Africa and Africans also stand against the international crimes that the Court was set up to prosecute. However, it is also important that whoever is elected is not seen as elected simply because he or she is African. The two candidates left are two very qualified candidates. Fatou Bensouda has been Deputy Prosecutor at the ICC for several years and before that was senior legal adviser at the International Criminal Tribunal for Rwanda. She has also been Attorney General in Gambia. Her CV is not only distinguished but I think those who have met her and spent time with her, as I have had the pleasure of doing, know that she is impressive and very capable. I don’t know Mohamed Othman but his CV is also very distinguished. He is Chief Justice in Tanzania and before this was Prosecutor General at the Special Panels for Serious Crimes established by the UN in East Timor. He was previously Chief of Prosecutions at the ICTR. Consultations are ongoing in New York in an attempt to narrow the field to one and to arrive at a consensus candidate. We might know by tomorrow who that one is. Fatou Bensouda is the candidate endorsed by the African Union and seems very much to be the front runner for the position. The BBC is reporting that the International Criminal Court has issued an arrest warrant for Laurent Gbagbo, the former president of the Cote d’Ivoire, and indeed that he is already on his way to the Hague. Gbagbo will be the first former head of state to sit in the ICC’s dock. Is Libya Under an Obligation to Surrender Saif Gaddafi to the ICC? (Part II) Has the UN Security Council Imposed Different Obligations of Cooperation from the Rome Statute? In a previous post, I dealt with the question whether Libya has an obligation to surrender Saif Al Islam Gaddafi pending any admissibility challenges it may choose to make. To put the question in other terms, if Libya does make an admissibility challenge may it hold on to Saif for the duration of the time it takes for that challenge to be determined by the ICC. The discussion that has taken place on this issue thus far has focussed on the interpretation of the relevant provisions of the Rome Statute. My previous post also focussed exclusively on the Rome Statute. However, thus far commentators on this question have simply taken it for granted that the Rome Statute provides the applicable law and regime regarding the obligation of Libya to cooperate. The assumption has also been that if the Rome Statute provides a basis on which Libya may suspend its obligation to cooperate with the ICC then Libya is entitled to rely on the Statute’s provisions allowing such suspension. Although this may well be right, it cannot simply be assumed. There is a question as to whether in the case of a Security Council referral, the obligation of cooperation is one which is determined by the Statute or whether that obligation is determined instead by the Security Council’s resolution that makes the referral. In short, can the Security Council modify the obligation of the State to cooperate such that the State has a more (or less) extensive obligation than is provided for in the Rome Statute? “shall cooperate fully with and provide any necessary assistance to the Court and the Prosecutor pursuant to this resolution.” [see para 5 of Security Council Resolution 1970, by which the Security Council referred the Libya to the ICC, the Council]. Does the obligation to “cooperate fully” mean an obligation to cooperate fully as required by, and only in circumstances required by the Statute or does it mean something else? In the particular context of the obligation to surrender Saif Gaddafi, I have argued that the Rome Statute permits a suspension of this obligation where a challenge to admissibility is made. However, it might be argued that what the full cooperation provided for SC Res 1970 requires is that Libya surrender Saif to the Court, as the Court has requested. Libya is not a party to the Rome Statute, and is therefore not bound by that treaty (qua treaty). It also does not have rights as such under the treaty. Any obligations that Libya has with regard to the International Criminal Court must be derived from the Security Council resolution which refers the Libyan situation to the ICC. The question whether the Security Council may modify the cooperation obligations provided for in the Statute was raised by Goran Sluiter, in 2008, shortly after the Sudan referral in an article entitled “Obtaining Cooperation from Sudan – Where is the Law?” In that article, Professor Sluiter noted that the way in which the Security Council had framed Sudan’s obligation of cooperation with the ICC left it unclear whether Sudan could invoke grounds for refusing cooperation which were provided for in the Statute. Since the capture of Saif Al Islam Gaddafi last week there have been questions asked about whether he ought to be tried in Libya or by the International Court Criminal which issued an arrest warrant for him in June. The Rome Statute of the ICC includes the principle of complementarity which means that the ICC must defer to genuine national proceedings. If the Libyan authorities are serious about conducting domestic proceedings against Saif they would be entitled to challenge the admissibility of the ICC proceedings under Article 19 of the ICC Statute. I was just reading today this report in the New York Review of Books on the escalating political situation in Jordan when I noticed a remarkable point which I hadn’t yet seen reported in the international blawgosphere. It appears that last month King Abdullah of Jordan appointed Judge Awn Al-Khasawneh of the International Court of Justice as Jordan’s new Prime Minister. Judge Al-Khasawneh has of course had a distinguished career both within Jordan and internationally and has accepted his new appointment. What struck me – if I am not mistaken – is that it seems that this is the first time a serving ICJ judge (and at that one who was re-elected only a few years ago) was appointed as a head of government. Former ICJ judges have of course held high political office even after leaving the Court, e.g. in recent years former president Bedjaoui has for a time been the foreign minister of Algeria, while judge Elaraby has briefly been the foreign minister of Egypt after the fall of Mubarak and is now the Secretary-General of the Arab League. In any case, congratulations are due to Judge Al-Khasawneh. On a different note, it’s a bit odd that the ICJ’s website makes no mention of this development, even though I imagine Judge Al-Khasawneh already tendered his resignation as Art. 16 of the ICJ Statute would seem to require – unless the Court devised some other arrangement under the second paragraph of that article. This would mean that another election would soon have to be held, in addition to the contested remaining seat now held by Judge Koroma, on which Dapo reported earlier. At the end of October, I had the pleasure of spending a few days at the UN in New York where I was invited to speak to the annual meeting of the Legal Advisers of Foreign Ministers of Member States of the UN. The annual meeting of Legal Advisers is held during what has come to be known as International Law Week at the UN. The meeting takes place during the period in which the International Law Commission’s report is being debated in the Sixth (Legal) Committee of the General Assembly and around the time the President of the International Court of Justice delivers its annual report to the UN. In the period I was there the President of the International Criminal Court also spoke to the General Assembly. It was also an interesting time to be there because this was the time in which candidates for elections to the various UN legal bodies show up in New York to “campaign” (if that is not too ugly a word). There are also a number of receptions held in the evenings by State’s missions to the UN to promote their candidates. There are quite a number of elections to legal bodies this year so there was a lot of this sort of promotional activity. This year there are elections to the ICJ (see here), elections to the International Law Commission (which were held yesterday), elections for ICC Prosecutor and for a number of ICC judges. The annual meeting of the Legal Advisers was a 2 day affair and I was invited to speak on a panel on the Contribution of the International Court of Justice to the Development of International Law. My co-panellists were President Hisashi Owada of the ICJ and UN Under-Secretary General Patricia O’Brien (the UN’s Legal Counsel). The panel was chaired by Ambassador Anders Ronquist who is the Director General for Legal Affairs at the Swedish Ministry for Foreign Affairs (and sitting to my right was Alan Kessel the Legal Adviser of the Canadian Dept of Foreign Affairs who was one of the co-ordinators of the Meeting of Legal Advisers). President Owada spoke about the contribution made by the ICJ through it’s advisory jurisdiction. Patricia O’Brien spoke about the contribution of the ICJ to the development of the law relating to the UN touching in particular on questions of personality and immunity. I spoke about the contribution of the ICJ to the development of the law relating to the use of force. My speech is below. There was an interesting question and answer session following our session and I got lots of good questions about issues I covered as well as questions about issues I did not cover (eg about cyberwarfare). General Assembly and Security Council Elect Four Judges to the ICJ But Fail to Agree On Fifth Judge. What Happens Next? Last week the United Nations General Assembly and Security Council conducted elections to elect judges to the International Court of Justice (ICJ) (see UN Press Releases here and here). Under Articles 4 and 8 of the Statute of the ICJ, ICJ judges are elected by an absolute majority of General Assembly and the Security Council which are to meet separately. Five judges are elected to the Court every 3 years with each judge being elected to a 9 year term. The usual procedure for the elections is that both the GA and the SC meet separately, but concurrently. Once five judges have obtained an absolute majority in one organ the President of that organ will notify the President of the other organ of the names that candidate. In the election held last week, four candidates received an absolute majority in each organ and were elected to the Court. Three of those were judges were reelected to the Court, namely: President Hisashi Owada (Japan), Vice President Peter Tomka (Slovakia) and Xue Hanqin (China) who was elected to the Court for the first time last year (see previous post here). In addition, one new judge Professor Giorgio Gaja (Italy) was elected. Professor Gaja is a member of the International Law Commission and was special rapporteur on the recently adopted articles on the responsibility of international organizations (see posts here and here). When he takes up his position, Professor Gaja will effectively replace Judge Bruno Simma on the Court. 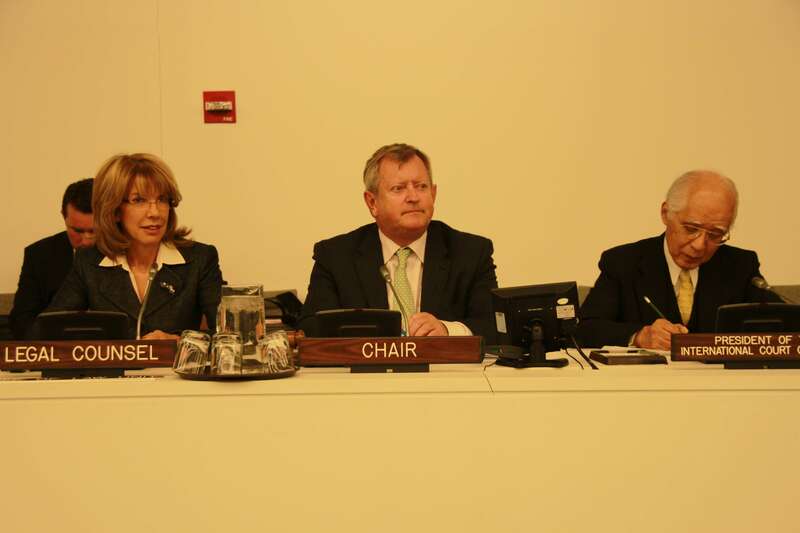 These four judges were elected in the first round of balloting in the General Assembly and the Security Council. Unusually, the GA and SC were unable to fill the fifth vacancy on the Court as both organs failed to agree on a candidate for that vacancy. That vacancy was effectively reserved for an African candidate and was contested by Judge Abdul Koroma (Sierra Leone) who is the most senior judge at the ICJ, having already served on the Court for 18 years, and Judge Julia Sebutinde (Uganda) who is the Presiding Judge in the Trial Chamber of the Special Court for Sierra Leone hearing the Charles Taylor case. Judge Koroma obtained a majority in each of the five rounds of balloting held in the Security Council. However, though the General Assembly had seven rounds of balloting, Judge Koroma failed to obtain a majority in that organ and it was Judge Sebutinde who obtained a majority in five of those rounds. In the last four rounds of balloting in the GA the votes were extremely close with there being a difference of no more than four votes (out of 193) between the two candidates in each of those rounds. In fact in the 7th round, Judge Sebutinde only just obtained an absolute majority of votes (97) and Judge Koroma obtained just one vote less (96). Comments Off on General Assembly and Security Council Elect Four Judges to the ICJ But Fail to Agree On Fifth Judge. What Happens Next?